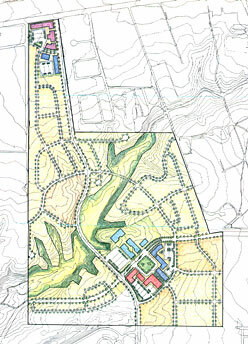 Tierra Contenta is a 1,421 acre, 5,800 unit mixed-use residential development on the southwestern edge of Santa Fe. Planned as a pedestrian-oriented community, neighborhoods are organized around mixed-use village centers, each containing an elementary school, civic buildings, apartments, retail stores and a public plaza. The large arroyo system that crosses the site is preserved as a natural area and recreational resource. To arrive at community consensus for this project, the master plan was developed in a series of public forums, design charrettes and focus group meetings. Design guidelines address the public aspects of building types in Tierra Contenta to create an active streetscape that favors people over cars and garages. The guidelines also focus on water conservation, sun-tempering of buildings, re-vegetation and walking and biking trails establishment. The development provides both affordable and market-rate housing for the citizens of Santa Fe.